MISSION, KS--(Marketwired - Jul 22, 2016) - (Family Features) If you're shopping for a new gas grill, one of the most important aspects to consider is its size. 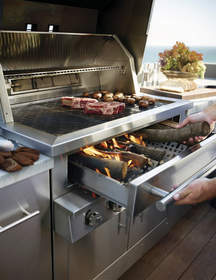 "There are more things to think about than simply how many hamburgers you want to cook at once," said Russ Faulk, grillmaster and chief designer for Kalamazoo Outdoor Gourmet, maker of outdoor kitchen equipment. "To a great extent, more size offers more cooking flexibility. Few people need a giant grill, but most people can take advantage of having a bit more cooking space." Think about indirect cooking. When you envision cooking on the grill, you probably think about grilling the food right above the fire. This is called "direct heat" grilling, which is good for small or thin foods than can be cooked quickly. Larger foods, such as whole chickens, potatoes or roasts, are best cooked with "indirect heat." This means the burners below the food are actually turned off. You need a grill large enough for the active burners to generate the right amount of heat and have enough space left over to place the food in an indirect zone. The magic really happens when you combine direct and indirect techniques, Faulk said. Some call it "sear and slide" cooking, which is an indispensable method for grilling a thick steak. Sear it over high, direct heat then move it to indirect heat to slow down the cooking. A grill with at least 700 square inches is recommended for cooks who frequently embrace indirect grilling techniques. Don't crowd the grill. When you try to squeeze too much food onto the grill at once, it can become difficult to manage the cooking. You need room for turning and flipping. Faulk also recommends maintaining a low-heat "safety zone" to move food to when the action gets a little too hot and fast. A good rule of thumb is to keep at least 25 percent of your grill grates clear at all times.